Nearly two centuries before Marco Polo’s travels to Cathay, there lived in the fabled city of Baghdad the famed rogue and adventurer Sinbad. 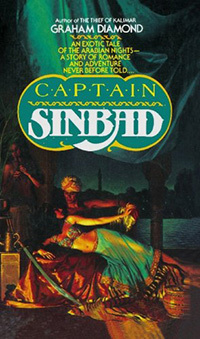 Tales spoke of the mighty Captain Sinbad: adventurer, soldier, poet, and mariner. When Sinbad washes up on the shores of Pansa, it is surely a good sign for the young women of the village. As the handsome and mysterious stranger recovers, he is begged of a particular beauty to recall his adventures and what led him to this point. But his travels have not been without trouble. Driven from home and the arms of his beloved Scheherazade, Sinbad has become an outlaw voyaging across the Seven Seas. The corrupt Caliph of Baghdad has taken Sinbad’s love to be his wife, and now Sinbad must flee for his life. But soon, he learns of a magical flower, the Red Dahlia, that grants a wish to the person who crushes it. 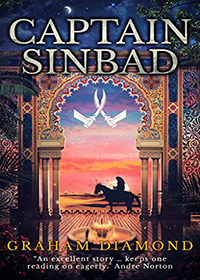 Nothing will stand in his way.Captain Sinbad is a gripping mythical fantasy adventure set in the medieval Middle East.